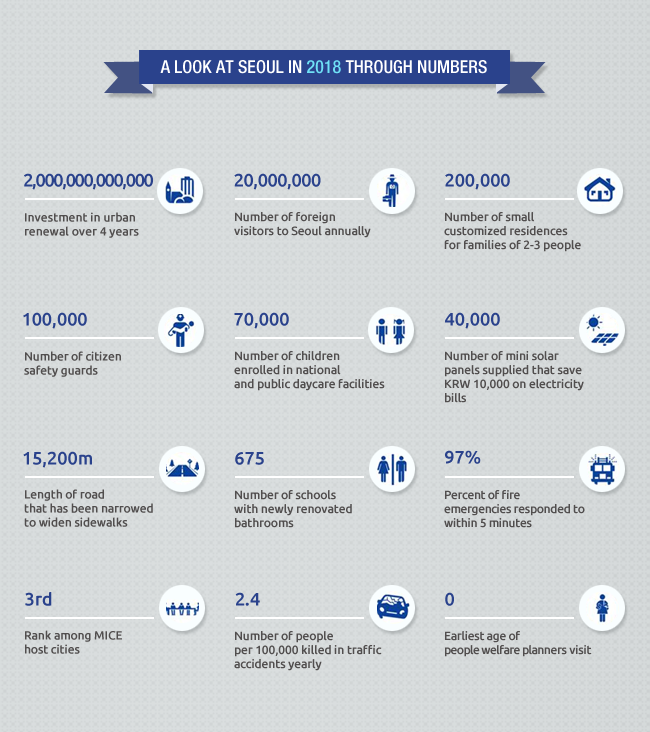 This month, September 2014, the Seoul Metropolitan Government has announced the “Four-Year Plan for Seoul,” a blueprint for Seoul in 2018 designed by Seoul Mayor Park Won Soon for his 6th term in office. 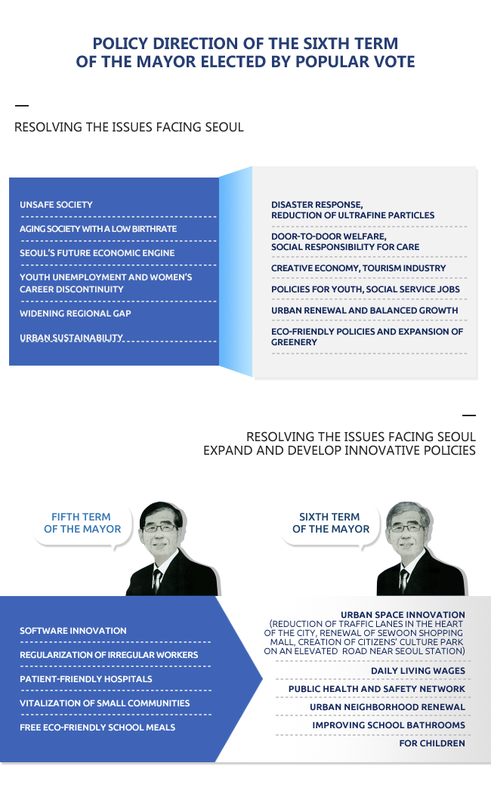 His vision for Seoul over the next four years is summarized by the phrase “People centered Seoul, Citizen happy Seoul,” and revolves around the key words “safety,” “welfare,” “economy,” and “urban renewal”. This four-year plan consists of 139 projects in 13 districts of Seoul, with the goal of turning Seoul into a “Safe, Warm, Dreaming, and Breathing City”. Of these projects, 25 have been designated as key projects. Besides the four-year plan, the city government is also strongly committed to pushing ahead with administrative reform. The “Pedestrian-Friendly City” policy is expected to change the map of Seoul in the next four years. By 2018, the city government plans to narrow 12 lane roads by one or two lanes, a total of 15.2km, within the historical downtown “four gates” area of Seoul, in areas such as Cheonggyecheon, Daehak-ro, and Sejong-daero, where subway stations are extremely crowded. This is part of the plan to create spaces where pedestrians and bikers feel comfortable moving around the city without being threatened by speeding cars, at least within the historical “four gates” area of Seoul. Regarding welfare policies, the current Community Service Centers will be renamed “Village Welfare Centers,” and will provide greater welfare support services by operating with double the current number of social workers and visiting nurses and offering outreach services. One thousand national and public daycare facilities will be established over the next four years using highly creative means, such as by making use of unused classrooms in schools or establishing daycare facilities in work places, in order to make room for an additional 40,000 children in the daycare system. The city government will also work with the civil sector to replace squat toilets in schools. Currently, squat toilets account for 48 percent of school toilets and are one of the biggest complaints school children have. The government will apply newer designs to school bathrooms to ensure the comfort and convenience of the students. The project will target 675 elementary, middle, and high schools in Seoul. Of particular significance, the flooding issues in 27 flood prone areas, including the region around Gangnam Station and Dorimcheon, will also be resolved by the end of 2018, two years earlier than planned. Creative economy in Seoul has also been referred to as the “silver industries,” “digital and mobile convergence,” and “cultural contents”. The Seoul Metropolitan Government is planning to establish infrastructure for such new and creative areas, such as the elderly-friendly smart aging cluster in Hongneung (expect to be completed in 2017) and the Gaepo Digital Innovation Park (expect to be completed in 2016), and will support plans for creative economy in Seoul. Sewoon Shopping Mall, which had been slated for demolition in 2006, has been restored as the first part of an urban renewal project, aiming to create a stronger foundation for the city’s economy. By completing the path that leads from Bukhansan Mountain through Jongmyo and Namsan to Yongsan Family Park, thereby attracting more people to the area, the city government plans to rejuvenate Sewoon Shopping Mall, leading it to become the center of small-scale manufacturing and a catalyst for the rejuvenation of Seoul’s urban industries. 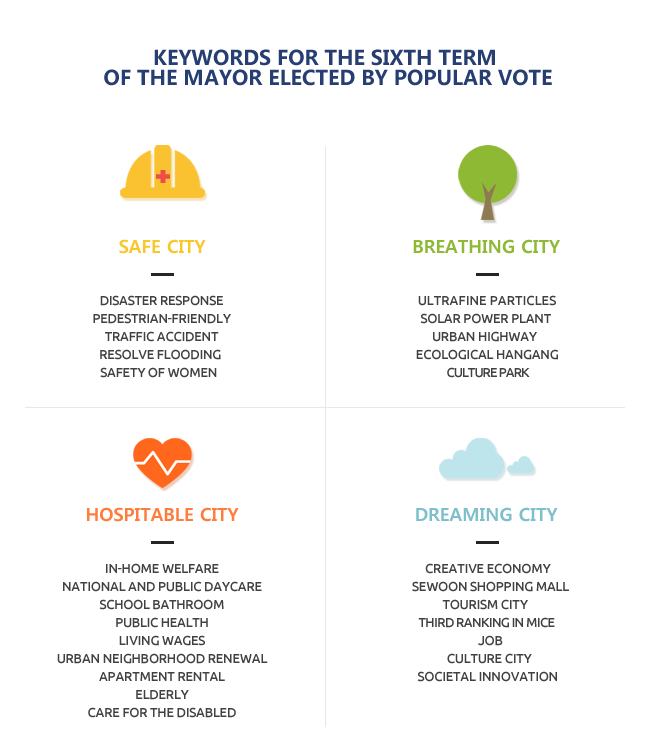 The plan includes all projects mentioned in Mayor Park Won Soon’s campaign pledges, projects that began during his 5th term, and new projects that began in his current 6th term as mayor. Over the past two months, members of the advisory committee have held a total of 50 meetings to review the projects, and have proposed the first plan, which reflects the combined experience and knowledge of all the government officials. This year, the Seoul Metropolitan Government appointed advisors, director generals, and managers for each project to execute the first four-year plan. Furthermore, the city government will continue supplementing and developing the plan until 2018 by conducting half-year assessments of the key projects, and will share the results of the projects with the citizens. The “Four-Year Plan for Seoul” announced by the Seoul Metropolitan Government will be officially approved in November, after thorough evaluations of public opinion. 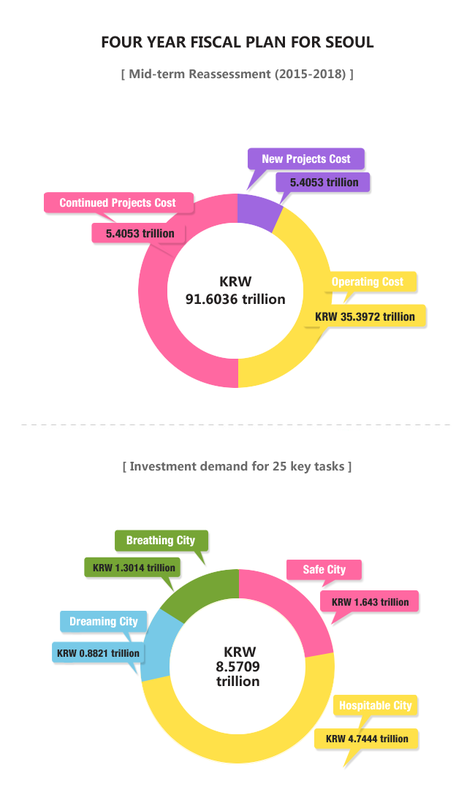 A total of KRW 8.3 trillion will be needed to carry out the 25 key projects, but among this amount, only KRW 3.8 trillion needs to be newly invested.